As Stephen wrote “Spending on the state pension will increase by nearly 20% in real terms between 2010–11 and 2017–18.” The challenge of an ageing population was present even before the financial crisis. It’s now even more essential to consider how public spending can be made to add up, and whether we’ve got it right on pensioner welfare spending, pension tax incentives and the pension age. Is the state pension progressive? Well, it is a universal benefit that goes equally to most OAPs, and pensioners are on average poorer. And the Coalition’s Single State Pension will make it simpler and more equitable. But the total amount you get from the pension also depends on the length of your retirement, and the grim truth is that poorer Brits don’t live as long as richer workers. Men currently receive the state pension from 65, and the “pensioner freebies” earlier. But ONS figures show that while a male ‘professional’ (at birth) could look forward to over 15 years of retirement (to over 80), an unskilled manual labourer might expect just 8 years (to 73). If anything, this inequality has grown over time. As reinforced by the premature deaths website, the chances of the unskilled worker reaching 65 to ‘get something back’ are much less than for managers and professionals. With an average life expectancy of 73, the majority of unskilled manual labourers in this country will never receive the free TV licence, nor the higher rate of winter fuel payment (nor the highest personal allowance, now to be phased out). Even for those who reach 65, the average professional will live almost 30% longer beyond that than their unskilled counterpart. That means 30% more state pension – even without future increases, to say nothing of those other ‘universal’ benefits. A long-running political stats issue is that we can only look at snapshots of incomes at a particular time. For individuals, the unemployment or low income caught by these snapshots might not be permanent. Ideally, however, we would also look at lifetime incomes and ensure that the tax and welfare system redistributes to those whose lives as a whole are more financially deprived. With higher-class individuals living longer, the state pension and pensioner freebies may not fulfil this function. This is in contrast to working age benefits, where benefit receipt is likely a much better predictor of lifetime poverty. I don’t mean to suggest that because the state pension etc. on average are worth less to the ‘lower classes’ that they should therefore be scrapped. As most people see it, workers pay in via taxation and then take out in old age, even if the unpredictable and inscrutable black box in between is more like a Ponzi scheme. So (even while ending the additional state pension) it might be reasonable for the rich to pay more in and then take more out through longer lives. 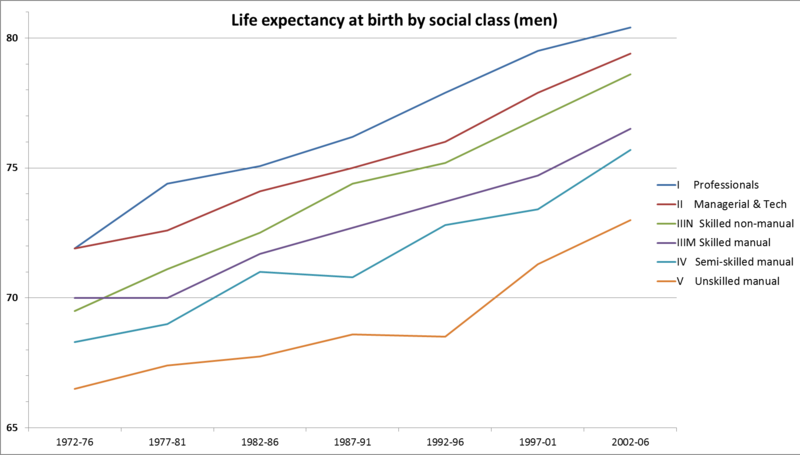 But the inequality is yet more reason to look critically and carefully at pensioner spending and the pension age. Rather than paying everyone a fixed income from an arbitrarily chosen age – too early for some, too late for others – government should instead give citizens an equal lump sum at the age of 60 [which must go into a pension scheme], leaving them to choose when to take it to an annuity provider to convert into a monthly pension income. Let’s call it the ‘state pension pot’. Those who choose to work longer would be rewarded with a higher income from their annuitised state pension pot upon retirement. And the new arrangement would be much fairer since annuity providers would reflect the lower life expectancy of lower-paid citizens in a higher annual retirement income. It would be right to say we must do more to reduce these health inequalities in the first place, but do the necessary policies cost money? If so, the chances are that they’ve been cut to make way for increased spending on those living longest.